It's been almost a year since Google first mentioned Hangouts Chat -- a totally redesigned messaging service that's more like Slack than the Hangouts most consumers know today. As of now, Hangouts Chat is out of its "early adopter" program and will be available to all G Suite users over the next week, assuming their company enables it, of course. To be clear, Hangouts Chat is a totally separate and distinct service from Hangouts proper, which still lives in your Google mail inbox. And while we'll forgive you for rolling your eyes at yet another chat service from Google (the number of different chat apps the company has built is legendary at this point), Hangouts Chat does offer something potentially valuable to companies using G Suite -- assuming they're not on Slack already. Just like Slack, Hangouts Chat features virtual rooms for different parts of a company's team or to organize people around a specific project or task. Each room can hold up to 8,000 people, and Chat works with 28 different languages total. Naturally, it has direct messaging and threaded conversations as well as apps for iOS, Android, macOS and Windows; there's also a web interface, of course. Hangouts Chat includes a total of 25 bots that interface with other G Suite apps — you can talk with @Drive to get updates on shared files, or use @Meet to check people's calendars and schedule meetings. Many of those bots are also built by third-party companies to interface with their own services, like Xero accounting or Jira and Trello for project management. As you'd expect, Google is keen on having other companies build their own integrations for Hangouts Chat, so it is also offering developer resources for anyone who wants to add their software to this new platform. Given Google's focus on AI across basically all of its products, it's no surprise that Hangouts Chat will use machine learning to try and figure out what users might need. Specifically, Google says AI will help book meeting rooms, find files "and more." Specifically, a link between Chat and Calendar will learn how to suggest locations to book by analyzing attendees' "building and floor location, previous booking history, audio/video equipment needs and room capacity requirements." It's hard to say how well this will work — but anyone working in a semi-large company also knows that booking a meeting room likely can't get any worse than it is right now. 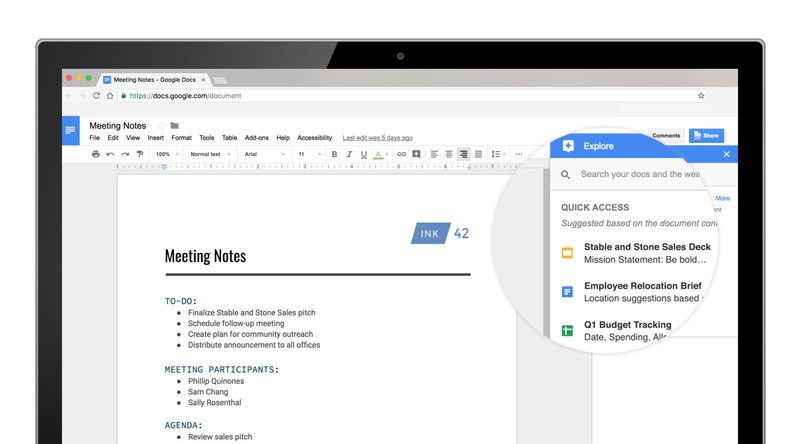 As for files, Google Docs will now feature the same "quick access" feature that predicts what files you might want to access in Drive. When you're working on a specific document, clicking the "explore" section will reveal related files that Google thinks might be useful. It's not clear yet how this will play into Hangouts Chat specifically, but give the tight ties between all of Google's various services it seems likely that these suggestions might be accessible right through the chat interface. On one hand, it's easy to roll our eyes at yet another attempt at Chat. But Google has been saying ever since it launched the consumer-focused Allo messaging app that Hangouts was destined for businesses. And at this point, despite the derivative name, Hangouts Chat is a messaging service that's pretty unique in Google's portfolio. The success of Slack has made it clear that more robust messaging apps than what the old Hangouts offered is important. Google might not have an easy time convincing companies to change their workflows to accommodate Hangouts Chat, but getting new customers on board is another story. Since G Suite customers get Hangouts Chat by default, giving it a shot will probably make both logistical and financial sense for many businesses — assuming, of course, that Hangouts Chat can get the job done.